CHANDIGARH, DEC 16,Union Minister of Information and Broadcasting Priya Ranjan Dasmunsi is poised to be re-elected president of the All India Football Federation. AIFF Returning Officer Harish Sharma has accepted his nomination and found correct as per constitution, norms and procedures of the federation. Born on November 13, 1945, Priya Ranjan Dasmunsi is holding the post of AIFF presidentship since 1988. 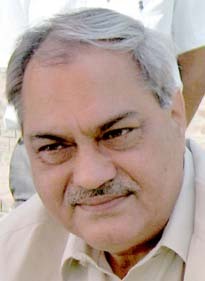 Former Minister of State in the Ministry of Civil Supplies, Consumer Affairs and Public Distribution in the Narasimha Rao Cabinet Venod Sharma will be among five vice presidents whose nominations were accepted and found correct. Venod Sharma, a prosperous hotelier, president of Chandigarh Football Association, will represent North along with Praful M Patel (West), AR Khaleel (South), Subroto Dutta (East) and Ankur Dutta (North East). Punjab Football Association secretary Arjuna awardee Inder Singh and Haryana Football Association secretary Sunil Bhardwaj are executive members from north zone. Nominations of the following persons were accepted and found correct by the AIFF Returning Officer Harish Sharma. Subroto Dutta (East), Venod Sharma (North), Ankur Dutta (North East); Treasurer: Hardev Jadeja. Members: Amit Dev (West), Joaquim Alemao ber (West) , KMI Mather (South), C. R. Visswanathan (South), Tempo Bhutia Member (East) , M. A. Alam (East), Inder Singh (North), Sunil Bhardwaj (North), Ranjit Roy (North East) and Larsing M. Sawyn (North East).